Our flexible curriculum gives you access to a comprehensive course selection designed to meet state standards. A counselor partners with you and your parents to develop the right educational plan to meet your needs and increase your success in the future. PSEO The post-secondary enrollment options program is available either part or full-time to sophomores, juniors, and seniors. Students need to qualify in order to participate. Requirements vary from school to school. Students need to check with the colleges for applications and deadlines. 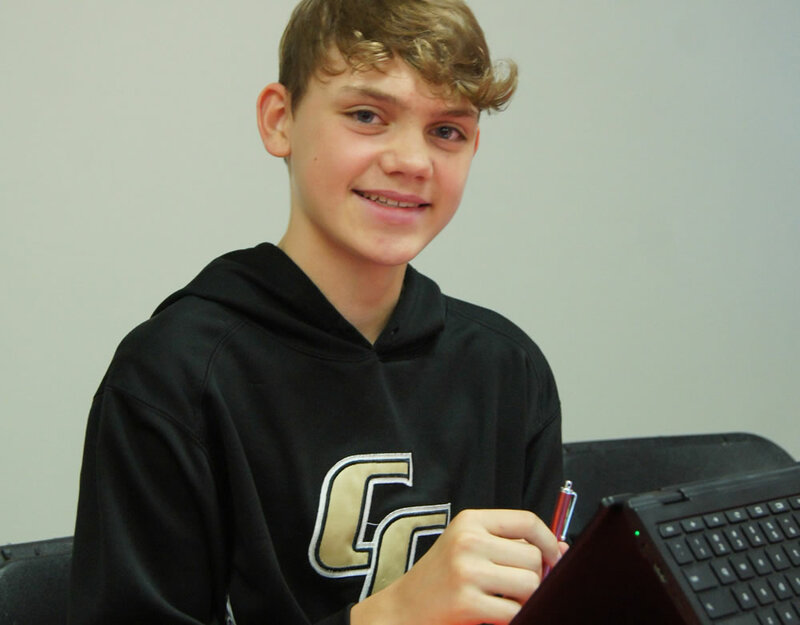 OCHS is a state funded program that provides qualifying high school students with the opportunity to earn post-secondary education credits online while still completing high school. Courses are taught through the Minnesota State Colleges and Universities System (MnSCU). English 7A -English is the study of the creation and analysis of literature written in the English language. In English 7A, you will explore different elements of fiction such as theme, characters, setting, and plot. You will also improve your writing by developing skills required for academic writing. You will evaluate how change affects society and an individual’s personal growth by analyzing various informational texts. In addition, you will conduct a group discussion on the topic of change. In the latter part of the course, you will examine various poetic devices and elements of drama. You will also compare a dramatic text to its film version. In the final unit, you will analyze elements of writing such as tone, audience, purpose, and structure in informational texts. English 8A – English is the study of the creation and analysis of literature written in the English language. In English 8A, you will explore the features of different forms of literary writing such as diaries, memoirs, informative essays, and fictional narratives. You will also improve your writing by learning about persuasive writing techniques. You will compare and contrast a literary piece across different mediums, including drama. You will engage in a dramatic reading of poetry and learn how to give multimedia presentations. In the latter part of the course, you will analyze informational texts to understand the history of the Civil War. You will also analyze various types of literary works to better understand literary elements such as point of view, conflict, theme, structure, and setting. English 8B – English is the study of the creation and analysis of literature written in the English language. In English 8B, you will analyze nonfiction texts to explore what they reveal about the process of growing up. You will also analyze elements of poetry such as theme, structure, meter, language, and sound to help you read poems and compose a poem of your own. You will read novels and analyze their literary elements and their use of literary devices. In the final unit, you will reflect upon and evaluate certain aspects of your past, present, and future while reading Charles Dickens’s A Christmas Carol. Mathematics is the study of the patterns around us. Using the tools in this course, you will learn more about how to solve problems using expressions and equations. When you understand how to work with numbers in equations, and how to manipulate equations, you can more easilysolve problems you encounter in everyday life. Mathematics is the study of the patterns around us. In this course, you will learn more about geometry, statistics, and probability. Geometry is a branch of mathematics that uses formal methods of thinking to show relationships between points, lines, surfaces, and solids. Statistics and probability are closely related subjects. In statistics, you will practice collecting and analyzing numerical data to make decisions. Probability is the study of the likelihood that an event will occur. Knowing more about these three disciplines will help you solve problems you encounter every day. Algebra is a branch of mathematics that uses symbols in place of numbers to describe and generalize relationships. In Algebra 1A, you will explore relationships between mathematical quantities, how to reason with equations and inequalities, graphing, and functions. You will build on your knowledge of variables, exponents, expressions, and algebraic terminology by applying algebra to real-world situations. Algebra is a branch of mathematics that uses symbols in place of numbers to describe and generalize relationships. In Algebra 1B, you will extend ideas to learned in Algebra 1A to factor and perform operations on polynomial expressions containing more than two terms. Many of the equations that you solved in Algebra 1A were linear, or proportional. In Algebra 1B you’ll solve quadratic equations. In quadratic equations, the highest power on a variable is 2. You’ll study the parabola, a conic section defined by a quadratic equation. You will also look at the algebra of working with radical signs exploring the inverse relationship between squaring a number and taking its square root. These algebraic concepts prepare us with applications to Geometry such as with the Pythagorean Theorem and working with Parallel and Perpendicular lines. Finally, you’ll study statistics as you interpret the shapes of data distributions and delve into correlation and causation. In Middle School Earth Science you will study the natural world. During semester A, you will first explore the formation of the universe all the way through the formation of the Earth. You will learn about what makes up the universe, including galaxies, stars, nebulae, our solar system and other planetary systems. The second half of the semester, we will be exploring all of the dynamic geological process that take place on and in the Earth. This will include plate tectonics, earthquakes and volcanoes. In Middle School Earth Science you will study the natural world. During semester B, we will study many of the processes that occur on Earth. You will learn about rocks, minerals and the rock cycle. You will learn about the processes of the water cycle. You will learn about the many processes in the atmosphere, including weather and climate change. Finally, you will learn about where natural resources come from and how they are used. Middle School Life Science A introduces scientific investigations, methods, observations, and communication, followed by the study of the cell, cell transport, metabolism, division, and reproduction, molecular biology, DNA, RNA, protein synthesis, Mendelian and non-Mendelian genetics, human genetics, and biotechnology. With that understanding, it covers the sometimes touch topic of Darwin’s theory of evolution, natural selection, evidence of evolution, and speciation. The semester ends covering the single-celled organisms and also fungi. Middle School Life Science B studies different kinds of plants (including vascular seedless, nonvascular seedless, gymnosperms, and angiosperms), and discusses reproduction, plant hormones, and tropism. The is followed by studying animal behaviors and the various forms of animals (invertebrates and vertebrates) along with Human Biology. The semester ends by introducing ecology including discussions on biomes, populations, ecosystems, pollution, resources, and energy. US History is the study of the events, people, and culture of the United States over time. In American History A, you will learn about the process of historical inquiry, review the events and principles behind the founding of the United States, and then apply historical inquiry to analyze societal issues, trends, and events from the Industrial Revolution through the Gilded Age. You’ll explore timelines to gain an understanding of how events link to each other, and you’ll analyze historical documents for a firsthand sense of how events unfolded. You’ll also gather evidence from relevant documents and historical texts in order to develop credible explanations of events in US history. You’ll then use that evidence to evaluate change and continuity over time by writing essays and creating presentations about broad periods of historical development. US History is the study of the events, people, and culture of the United States over time. In American History B, you will apply historical inquiry to analyze societal issues, trends, and events of US history from the beginning of the 20th century to the present. You’ll explore timelines to gain an understanding of how events link to each other, and you’ll analyze historical documents for a firsthand sense of how events unfolded. You’ll also gather evidence from relevant documents and historical texts in order to develop credible explanations of events in US history. You’ll then use that evidence to evaluate change and continuity over time. Geography is the study of where things are in the world. It is important to know why people settled where they did: sometimes this is for weather-related reasons, and sometimes it’s because of bountiful natural resources nearby. In this course, you will learn about these special features which drive economic development and form the locales where people settled. This course provides students with a basic understanding of fitness and nutrition. Students will learn about exercise safety, team and individual sports, nutrition, and the importance of staying active throughout their lifetime. Students conduct fitness assessments, set goals, develop their own fitness program, and participate in weekly physical activity. Life Skills. This course allows students to explore their personality type and interests, as well as refine important skills that will benefit them throughout their lives, including personal nutrition and fitness skills, time and stress management, communication and healthy relationships, goal setting, study skills, leadership and service, environmental and consumer health, and personal finances. In addition, students will explore possible colleges and careers that match their needs, interests, and talents. Middle School Health. Aids students in creating a foundation of personal health. Beginning with properly defining health, this course then builds upon basic health practices to emphasize the importance of balance. Attention is given to each of the six dimensions of wellness; namely, physical, intellectual, emotional, spiritual, social, and environmental. Students are taught the skills necessary to improve every aspect of health. They are also encouraged to reflect upon their own personal wellness each week. This course is designed to enable middle school students (Grades 7–8) to develop the critical skills and knowledge that they will need to choose and plan for a successful career. This one-semester elective course is intended to introduce you to computer applications and technology used in careers. In this course, you will look at word processing, spreadsheets, and presentation programs and explore how computer applications and technology can be used to assist you. In Middle School Spanish, you will start by reading and listening to several beginner-level books from TPRS Publishing. As you continue you will practice speaking by completing student-friendly Extremo Activities. By the end of the course, students will have received an incredible amount of Comprehensible Input, which is essential for language learning. In this course you will learn about the elements and principles of Art. Additionally, students will consider what the artist is trying to communicate and create their own opinions on works of art. In this course you will review the basic features of art, explore the art of photography, encounter forms of animation, investigate aspects of graphic design, study facets of architecture, and observe alternative art forms. English is the study of the creation and analysis of literature written in the English language. In English 9A, you will study a variety of techniques to improve your reading comprehension and writing skills. The instruction covers many types of writing: creative, descriptive, expository, narrative, and persuasive. In English 9A, you will read and analyze literature in different genres as well as practice skills related to good study habits. You will sharpen your writing skills as you evaluate literary works with regard to literary technique, form, and theme. English is the study of the creation and analysis of literature written in the English language. In English 9B, you will study a variety of techniques to improve your reading comprehension and writing skills. The instruction covers many types of writing: creative, descriptive, expository, narrative, and persuasive. In English 9B, you will read and analyze Shakespeare’s play Romeo and Juliet, as well as read speeches and essays to evaluate their arguments. You will write evaluations of literary works with regard to literary technique, form, and theme. English is the study of the creation and analysis of literature written in the English language. In English 10A, you will explore the different literary devices used in short stories, such as subject, theme, mood, plot, and narration. You will read and analyze a variety of literary works to learn more about a particular literary device. The second unit covers many types of informational texts. In the third unit, you will read and study drama from a range of eras. In addition, you will complete writing activities in which you will employ analytical and persuasive skills. In English 10A, you will also study a variety of techniques to improve your reading comprehension, writing skills, and grammar and mechanics. English is the study of the creation and analysis of literature written in the English language. In English 10B, you will explore characteristics of different genres of fiction, such as realistic fiction, historical fiction, and science fiction, and analyze historical context, theme, and genre in Franz Kafka’s novella The Metamorphosis. The second unit covers many types of nonfiction writing, including memoirs, personal essays, public essays, speeches, and narrative nonfiction. In the third unit, you will analyze traits and genres of poetry. In addition, you will complete writing activities in which you will employ analytical and persuasive skills. In English 10B, you will also study a variety of techniques to improve your reading comprehension, writing skills, and grammar and mechanics. English 11A – English is the study of the creation and analysis of literature written in the English language. In English 11A you will study a variety of techniques to improve your reading comprehension and writing skills. The instruction covers many types of writing: creative, descriptive, expository, narrative, and persuasive. In English 11A, you will read and analyze different genres in literature with an emphasis on American literary movements over time. You will also complete writing activities to evaluate literary works with regard to literary techniques, form, and theme. English 12 A explores the relation between British history and literature from the Anglo-Saxon period through the neoclassical era. The lessons in this course present learners with relevant cultural and political history, and readings are scaffolded with pre-reading information, interactions, and activities to actively engage learners in the content. Incorporated into the lessons, as well as into the higher-level unit activity in course activities, are sections that focus on developing grammar, vocabulary, speech, and writing skills. These components together are designed to address the four key elements of English language arts instruction – reading, writing, language, and speaking-listening skills. English 12 B is the study of the creation and analysis of literature written in the English language and in English 12B you will explore the relation between British history and literature from the romantic period to the modern era. You will read and analyze a variety of literary works from this time period in the context of relevant cultural and political history. In English 12 B, you also study a variety of techniques to improve your reading comprehension, writing skills, and grammar and mechanics. The instruction covers many types of writing: creative, descriptive, expository, narrative, and persuasive. In addition you will complete writing activities in which you will employ analytical and persuasive skills. This course offers diagnostic and remedial activities designed to correct reading difficulties that interfere with students’ progress in developing reading skills and understandings. Activities improve reading comprehension, reading technique and general literacy skills. They may include time management, note taking and strategies for determining main ideas and supporting details in a text. Students will complete activities that will assist them in understanding reading across the curriculum. They will complete an independent reading project. Algebra is a branch of mathematics that uses symbols in place of numbers to describe and generalize relationships. In Algebra 2A, we start by working with graphs, functions, polynomials and restrictions on those functions and graphs. In Unit 2, we will learn how to read and evaluate mathematical situations, by graphing, defining functions. Unit 3 concentrates on Polynomials and simplifying larger expressions. Finally, we will perform operations and identify restrictions on rational expressions. By the end of Algebra 2A you will be prepared to jump right into Algebra 2B! Algebra is a branch of mathematics that uses symbols in place of numbers to describe and generalize relationships. In Algebra 2B, you will begin with working with Quadratics and their graphing properties. You are then introduced to a new concept: complex numbers. Complex numbers rely on an imaginary unit, i, where (i * i) = -1. Unit 2 focuses on exponents, radicals, logarithms and their graphs, not forgetting the properties of exponents and logarithms that are used to solve specific formulas. In this course, you will learn practical applications of math. You will learn how to plan a budget, manage bank accounts, and figure the cost of a good or service. You will also learn about taxes, payroll deductions, and how to invest and borrow money. This course will help you make informed decisions about buying or renting a home or car and teach you how to protect your purchases and investments with insurance. Finally, you will study economics, or the science of the creation, distribution, and consumption of goods and services. You’ll see how economics affects you as an individual and how it affects the country as a whole. This course is designed to emphasize the study of the properties and applications of common geometric figures in two dimensions. It includes the study of transformations and an introduction to right triangle trigonometry. Inductive and deductive thinking skills are used in problem solving situations. It also emphasizes formatting proofs to solve (prove) properties of geometric figures. This course is designed to emphasize the study of the properties and applications of common geometric figures in two and three dimensions. It includes the study of polygons, circles, and right triangle trigonometry. The course emphasizes the connections from geometry to algebra, geometry within a coordinate plane. It also emphasizes formatting proofs to solve (prove) properties of geometric figures. Probability and Statistics is a mathematics course that teaches two related, but distinguishable disciplines. Probability is the study of the likelihood that an event will occur. In statistics, you will practice the science of collecting and analyzing numerical data in order to make decisions. The study of statistics upholds that of probability. You’ve likely worked with both disciplines to varying degrees during your math education. In this course you will represent and interpret data using data plots, histograms, box plots, two-way frequency tables and scatter plots. You will study normal distributions and distinguish between correlation and causation. You will also determine the conditional probability of two events or whether the events are independent. Using counting techniques and the rules of probability, you will calculate probabilities and use the results to make educated and fair decisions. Stuyding higher algebra and trigonometry leads to a better understanding of calculus. In Pre-Calculus, you will explore and build your knoweldge of inverse, trigonometric, and logarithmic functions; trigonometric identities; complex numbers; and vectors. You will also explore and build your knowledge of conic sections, matrices, and apply this knoweldge to real-world situations. You will also study basic concepts of calculus, such as the limits of a function and area under the curve. This one-semester course is intended to help you familiarize yourself with the basics of accounting. This course covers the fundamentals of bookkeeping and financial statements. It also covers career opportunities and the key government regulations in the accounting field. In this course students will explore the anatomy or structure of the human body. In addition to learning anatomical terminology, students will study and the main systems of the body– including integumentary, skeletal, muscular, circulatory, respiratory, digestive, reproductive, and nervous systems. In addition to identifying the bones, muscles, and organs, students will study the structure of cells and tissues within the body. Biology is a science dedicated to studying all forms of life on Earth. You are probably familiar with life on a large scale, but do you know what makes up life? This course will teach you about the smallest building block of life—the cell. You will learn what makes a cell, how cells are built and their functions, as well as how mutations in cells can cause them to change genetically. Biology is a science dedicated to studying all forms of life on Earth. This course will show you how scientists categorize various types of life, as well as the structure of plants and animals. You will also learn about how ecosystems support different life forms, and how the systems change to cater to the life forms that live within them. Chemistry is all around you, involving the matter that you interact with daily. Chemistry A will provide the student with an introduction to the physical and chemical properties of matter. We start with a review of the mathematic foundations needed, and do some measurements and calculations involving metric units such as kilograms, meters, and liters. An essential history of chemistry and science is presented in order to put the science in perspective and for the student to see how the structure of matter and the atom was developed, and led to the modern view of atomic structure. We return to the periodic table on a regular basis to show the relationship between the elements, and to provide for a way to predict the chemical reactions that cause the vast number of compounds to form in the universe. You will learn of the groups of chemical reactions that we use to categorize reactions, as well as the skills involved in balancing chemical equations. Finally, a study of gases provides an introduction to the atmospheric sciences. A good understanding of algebra prior to taking this couse is required. Chemistry B is the second semester of our continued study of matter and energy. We start with thermochemistry, and learn about the energy changes involved in the formation and disintegration of chemical compounds, including reactions in our Sun. The student will learn about the history of our understanding of light, and other forms of radiation such as microwaves, infrared, and radio waves. A more detailed study of atomic structure will enable the student to see the underlying causes of chemical and nuclear reactions. We will study the reasons behind why chemicals react, and the speed at which they do so (rates of reaction). An introduction to organic chemistry provides the student with the background to discuss the fascinating chemistry of life. Completion of this second-semester course ensures the student’s compliance with all Minnesota Science Standards related to chemistry. In Introduction to Forensic Science, you will learn about the importance and limitations of forensic science and explore different career options in this field. You will also learn to process a crime scene, collect and preserve evidence, and analyze biological evidence such as fingerprints, blood spatter, and DNA. Moreover, you will learn to determine the time and cause of death in homicides and analyze ballistic evidence and human remains in a crime scene. Finally, you will learn about forensic investigative methods used in arson, computer crimes, financial crimes, and forgeries. In Integrated Physical Science you will study the nature of matter and energy. During semester A, you will explore the nature of matter and energy through the branches of chemistry and earth science. You will learn about the fundamental building blocks of matter and the chemical composition and properties of substances. You will also learn about how interactions between matter and energy influence the dynamic Earth system. In Integrated Physical Science you will study the nature of matter and energy. During semester B, you will explore the nature of matter and energy through the branches of physics and astronomy. You will learn about the different forms of energy and the applications they have in science and industry. You will also study forces and the effect a force has on an object’s motion. Your study of astronomy will include learning about the relationships between the Earth, the Moon, and the Sun. You will explore our solar system and the stars, nebulas, exoplanets and galaxies that make up the rest of the universe. The course will end with learning and doing a project about the relationship between science and engineering. This course is designed to develop the critical skills and knowledge to help students prepare for entry into a wide range of careers and/or into postsecondary education. Economics is a social science that teaches how goods and services are created, consumed, and exchanged. Economics can cover topics locally, like how buyers and sellers of goods and services interact with one another. But it also covers topics on a larger scale, like studying a country’s role in the international marketplace. Economics examines the efforts, decisions, and thought processes of people. Studying economics can tell why individuals, industries, and governments behave in certain ways. In Economics you will learn about your role as a consumer and also the basic principles of the U.S. free-enterprise system and how that system ties into the global market, you will learn about the role that business and industry plays in a nation’s economy and the relationships that industry has with the government. You’ll also learn more about the people who initiate businesses and the ups and downs that occur in a business cycle. Furthermore, you’ll study important historical events surrounding labor laws and the responsibilities you have as a consumer in an economic system. Self-knowledge is the key to self-improvement! Psychology is a subject that can be applied to everyday life. New research and ideas will change the way we view ourselves and each other. This course offers exciting online psychology experiments about our own behavior and how we behave with other people. Knowledge is the key to the improvement of society! Sociology is a subject that can be applied to everyday life. New research and ideas will change the way we view ourselves and each other. This course offers exciting online Sociology experiments about the behavior of different groups, cultures, and societies, and how we behave when part of different groups. Social issues affect everyone—they are issues which revolve around governmental policy and enforcement of laws on the civilian population. These laws and policies can have any number of significant outcomes. They can protect minorities and women from discrimination, regulate drug use, give aid to the poor, provide guidelines for education, and much more. Social issues are often controversial and debated, so having the ability to form an educated opinion on them is an important part of your citizenship. It is equally important to learn to do so in a respectful manner. It is an expectation of the course that each person and their opinions are treated with civility and decency. US Government is the study of the founding principles of democracy in the United States, the structures and details of how the government functions, and the role of the individual citizen in participating in that democracy. In US Government, you will learn about the principles and events that led to the founding of the United States in the eighteenth century; examine how the operations of the US government are spread among three branches of government and distributed between the national, state, and federal levels of government; explore the role of the individual citizen in the operations of the government; and, finally, apply these concepts to understanding the concrete areas of foreign, domestic, and economic policy. You’ll explore timelines to gain an understanding of how events link to each other and to the structures of government that exist today, and you’ll analyze historical documents for a firsthand sense of how government structures were designed. You’ll also gather evidence from relevant documents and historical texts to develop credible explanations of how and why the government exists as it does. You’ll then use that evidence to express viewpoints on the operations of government by writing essays and creating presentations about topics of relevance to modern US citizens. US History is the study of the events, people, and culture of the United States over time. In US History A, you will learn about the process of historical inquiry, review the events and principles behind the founding of the United States, and then apply historical inquiry to analyze societal issues, trends, and events from the first European Colonies through the beginning of the 20th Century. You’ll explore timelines to gain an understanding of how events link to each other, and you’ll analyze historical documents for a firsthand sense of how events unfolded. You’ll also gather evidence from relevant documents and historical texts in order to develop credible explanations of events in US history. You’ll then use that evidence to evaluate change and continuity over time by writing essays and creating presentations about broad periods of historical development. US History is the study of the events, people, and culture of the United States over time. In US History B, you will apply historical inquiry to analyze societal issues, trends, and events of US history from the beginning of the 20th century to the present, including the World Wars, the Great Depression, the Cold War, Civil Rights and other social movements, the Vietnam War, modern presidencies, and responses to global terrorism. You’ll explore timelines to gain an understanding of how events link to each other, and you’ll analyze historical documents for a firsthand sense of how events unfolded. You’ll also gather evidence from relevant documents and historical texts in order to develop credible explanations of events in US history. You’ll then use that evidence to evaluate change and continuity over time. The world is always changing. By studying past events, particularly the affairs of people and societies around the world, you’ll be able to better understand global changes that take place today. The study of World History involves the discovery, compilation, and presentation of facts surrounding worldwide events. History is more than just memorization of dates and events. It’s important for you to understand why events took place and to identify general trends over time. The Spanish-speaking world is vast and rich, spanning Spain in the Iberian Peninsula and many parts of North, Central, and South America, all with varied ethnic and political histories and cultures. In Spanish 1A, you’ll be introduced to several common situations in which people communicate, such as exchanging names and greetings, describing people by physical and personality traits, and describing family members and aspects of your social life. To give students more contextualized language and comprehensible input, stories will be presented through a method called TPRS (Teaching Proficiency through Reading and Storytelling) via video, readings, and recordings. The Spanish-speaking world is vast and rich, spanning Spain in the Iberian Peninsula and many parts of North, Central, and South America, all with varied ethnic and political histories and cultures. In Spanish 1B, you’ll be introduced to several common situations in which people describe how to earn, save, and manage money, modes of urban transportation, various seasons and the associated weather conditions, food, clothes, and activities. You’ll also describe various art forms, plays, concerts, and movies. You’ll discuss health and well-being and travel and tourism. To give students more contextualized language and comprehensible input, stories will be presented through a method called TPRS (Teaching Proficiency through Reading and Storytelling) via video, readings, and recordings. The Spanish-speaking world is vast and rich, spanning Spain in the Iberian Peninsula and many parts of North, Central, and South America, all with varied ethnic and political histories and cultures. In Spanish 2A, you’ll be reintroduced to Spanish in common situations, beginning with describing classes, school friends, teachers, and school supplies. You’ll discuss different styles of dressing, housing and neighborhoods, and learn about relationships between family members and friends, students and teachers, and employees and employer. You’ll also describe daily personal routines and schedules, household chores and family responsibilities. Finally, you’ll discuss different types of cuisine, dining establishments, and dining etiquette. To give students more contextualized language and comprehensible input, stories will be presented through a method called TPRS (Teaching Proficiency through Reading and Storytelling) via video, readings, and recordings. The Spanish-speaking world is vast and rich, spanning Spain in the Iberian Peninsula and any parts of North, Central, and South America, all with varied ethnic and political histories and cultures. In Spanish 2B, you’ll be reintroduced to Spanish in common situations, beginning with various professions and career plans for the future. You’ll discuss traveling to different regions and the flora and fauna found in each region and describe different types of trips, including road trips, camping, and ecotourism. You’ll also describe different hobbies, activities, and crafts that people enjoy. Finally, you’ll discuss about different medical specialists, including dentists and veterinarians, and describe symptoms related to illness and injury. To give students more contextualized language and comprehensible input, stories will be presented through a method called TPRS (Teaching Proficiency through Reading and Storytelling) via video, readings, and recordings. The Spanish-speaking world is vast and rich, spanning Spain in the Iberian Peninsula and any parts of North, Central, and South America, all with varied ethnic and political histories and cultures. In Spanish 3A, you’ll be reintroduced to Spanish in common situations, beginning with various professions and career plans for the future. You’ll discuss traveling to different regions and the flora and fauna found in each region and describe different types of trips, including road trips, camping, and ecotourism. You’ll also describe different hobbies, activities, and crafts that people enjoy. Finally, you’ll discuss about different medical specialists, including dentists and veterinarians, and describe symptoms related to illness and injury. To give students more contextualized language and comprehensible input, stories will be presented through a method called TPRS (Teaching Proficiency through Reading and Storytelling) via video, readings, and recordings. The Spanish-speaking world is vast and rich, spanning Spain in the Iberian Peninsula and any parts of North, Central, and South America, all with varied ethnic and political histories and cultures. In Spanish 3B, you’ll be reintroduced to Spanish in common situations, beginning with various professions and career plans for the future. You’ll discuss traveling to different regions and the flora and fauna found in each region and describe different types of trips, including road trips, camping, and ecotourism. You’ll also describe different hobbies, activities, and crafts that people enjoy. Finally, you’ll discuss about different medical specialists, including dentists and veterinarians, and describe symptoms related to illness and injury. To give students more contextualized language and comprehensible input, stories will be presented through a method called TPRS (Teaching Proficiency through Reading and Storytelling) via video, readings, and recordings. In this course students will explore concepts involving personal fitness, team sports, dual sports, and individual and lifetime sports. Upon satisfactory completion of this course, students will be able to: focus on health-related fitness as they set goals and develop a program to improve their fitness level through cardio, strength, and flexibility training. In addition, they will learn about biomechanics and movement concepts as they enhance their level of skill-related fitness. Students will learn about game play concepts and specifically investigate the rules, guidelines, and skills pertaining to soccer, softball, volleyball, tennis, walking and running, dance, and yoga. This comprehensive health course provides students with essential knowledge and decision-making skills for a healthy lifestyle. Upon satisfactory completion of this course, students will be able to: analyze aspects of emotional, social, and physical health and how these realms of health influence each other. Students will apply principles of health and wellness to their own lives. In addition, they will study behavior change and set goals to work on throughout the semester. Other topics of study include substance abuse, safety and injury prevention, environmental health, and consumer health. This one-semester elective course is intended to introduce you to computer applications used for college studies and in careers. In this course, you will look at word processing, spreadsheets, and presentation programs and explore how computer applications can be used to assist you with your work for college and careers. This course provides hands-on activities as well as content covering types of photography, careers, use of lighting, and manipulation of photographs. This course is structured into lessons and Course Activities as follows: The first four lessons are about the history of video games, types of early consoles, arcades, personal computers, and platform convergence. The next four lessons deal with game and player goals, game genres, player motivations, and player demographics. The next four lessons provide students an understanding of story and character development, game play, game styles, and level design. The next four lessons discuss game user interface, game audio, mobile and social gaming, and the different job roles in the video game industry. The next three lessons focus on game development phases, the role of management in game production, and various methods used for marketing games. The final lesson is about the future of gaming; it discusses existing trends and possible directions in video gaming. In Health Careers, students explore a variety of career options related to the health care field, including medicine, nursing, physical therapy, pharmacy, dental careers, sports medicine, personal training, social work, psychology, and more. Students will learn about various options within each field, what each of these jobs entails, and the education and knowledge required to be successful. In addition, they will focus on basic job skills and information that would aid them in health care and other career paths. Art has played a significant role in every major civilization throughout the history of the human race. The emergence of different art forms often reflects the values that a civilization deems important: religion, labor, love, political change, or even commerce. Since artwork and cultural values are so closely related, studying art is a compelling way to learn about the people who produced it and the environment in which is was created. Art is communication, history, culture, conflict, and progress. This one-semester course is intended as a practical, hands-on guide to help you understand the skills required for achieving success in modern-day careers in the arts, audio/video technology, and communications cluster.